From "CVNC: an Online Arts Journal in North Carolina"
"In any production of Fiddler on the Roof, it is essential that there be a truly superb actor/singer to portray the central character of Tevye. 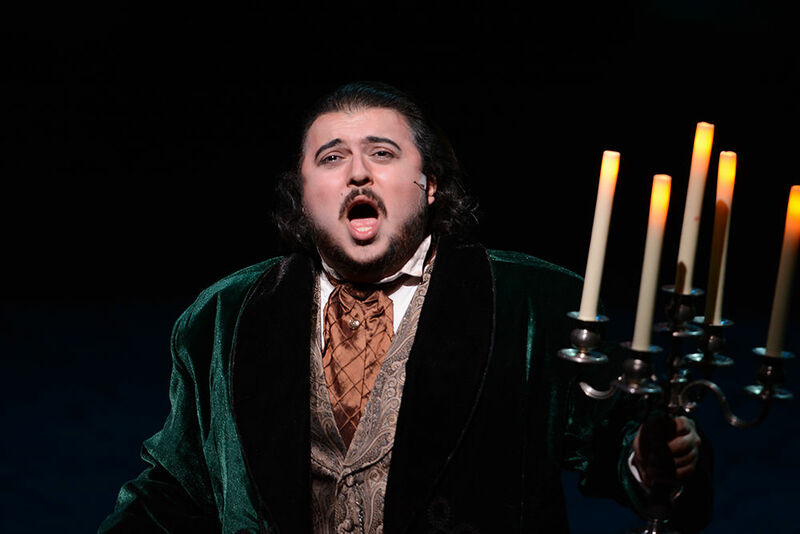 [Director John McIlwee] is fortunate to have just such a performer in the role, Areon Mobasher, who not only looks the part but has a superb baritone voice that is big enough to match this larger-than-life character. ...The plot is thickened by several different characters and supported by a tremendous score of eighteen songs, ranging from the full-scale opener, 'Tradition,' to the singular and iconic solo by Tevye, 'If I Were a Rich Man,' which Mobasher handled with the requisite skill and physical complexity of joy and contemplation. When he is alone, Tevye speaks directly to God, as if He were a friend and confidant. Mobasher was a tour-de-force, giving full-throttle voice to all of Tevye's many different moods. Tevye lives his life wide open, and Mobasher's ability to handle both his rages and his acceptance of what life throws at him made Tevye a joy to watch. From 'If I Were a Rich Man' to the gentle and sad 'Chavaleh (Little Bird),' Mobasher brought a nuanced and complex characterization to life onstage." From "Triangle Arts & Entertainment"
"The supporting cast was also absolutely top-notch, with Areon Mobasher proving to be the standout in an already sparkling ensemble." "...Archibald Craven, played by Areon Mobasher, brought a particularly raw emotional power to his vocal performance that was key to the success of the production." "Areon Mobasher makes an impressive Bare Theatre debut as Foster, the group’s Tolkien-esque mage. He commands the stage with terrific physical and vocal presence, balancing the cockiness of a veteran gamer with the uncertainty of one who hasn’t known much success. Mobasher is an up-and-comer worth keeping tabs on." From "The News & Observer"
"Areon Mobasher's trickster Pirelli is... impressive in stratospheric notes and fatuous pomposity." "As the barber Pirelli, Areon Mobasher adds another memorable performance to an increasingly impressive résumé."